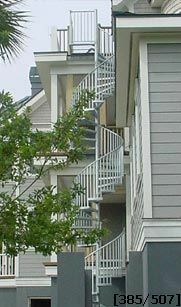 Stairways, Inc.'s code compliant all welded 60" diameter spiral stair which is three stories high. Spiral staircase handrail # 200 - 1 1/2" round 16 gauge tubing; spiral stairs main and center balusters, spaced less than 4" apart to be code compliant, # 302 - 1" square tubing; spiral stair treads # 133 - radial grate with a 30 degree run at the widest point; spiral stair treads are made out of a 3/16" A-36 grade steel material. The center column is from a 3 1/2" I.D. schedule 40 round pipe. The stair has a factory finish of hot dip galvanization. The spiral stair was built in three sections for easy shipping and then was stacked together at the job site. Stairways, Inc. offers a couple of grating options for spiral staircase steps and landings. Standard bar grating is cut from a sheet of grated steel and banded to form a spiral stair step. These spiral stair steps work well in industrial applications when dirt, oil and grease can be on the floor. Bar grate spiral stair steps can also come with a serrated edge for even less slippage. Our second grating spiral staircase step is radial grating. This step is handmade forming a radial pattern out from the center, beautiful and contemporary, and perfect spiral stair step for beach sand or snow and ice.